The last family picture was about integrated nibs. Among them, the Pilot Myu 701 holds a special place. It is arguably one of the few Japanese fountain pen icons, and its popularity is boosting up a bubble in the market, although some might say this is just the way supply-and-demand works. As this bubble affects to some other models more or less related to the all steel Myu 701. Today’s family portrait shows some of these close relatives. The common element to all of these pens is the inlaid steel nib, save for one exception whose similarities with the rest of the set are clear. Myu-701 (top) and Myu-25 (bottom), side by side. There are clear differences on the clips of these pens, but those of the Myu-701 (second from the left) and of the Myu-25 (center) are identical. 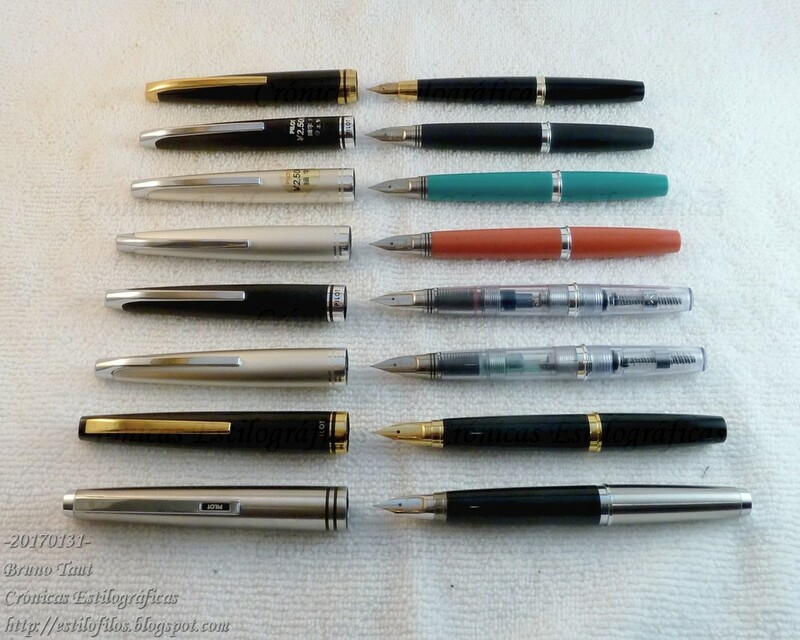 Most of the pens on the family picture are examples of the model Myu-25 in different colors, and with transparent bodies. These last two seem to be demonstration products and were not for sale. 1.- Unknown model. 18 K Au nib. January 1975. 2.- Myu-25 matte black. January 1975. 3.- Myu-25 green. May 1975. 4.- Myu-25 pink. August 1975. 5.- Myu-25 transparent, black cap. December 1974. 6.- Myu-25 transparent, aluminum cap. April 1975. 7.- Unknown model, shiny black, gold trim. September 1980. 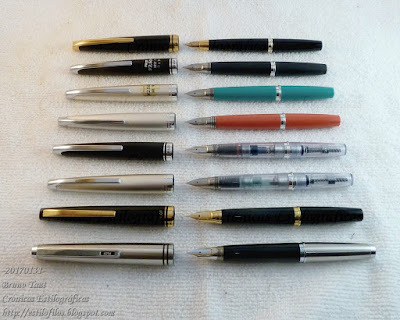 As can be seen, most of them were made in 1975 and the two remaining pens, with very different clips, are more recent in production: 1980 and 1988. 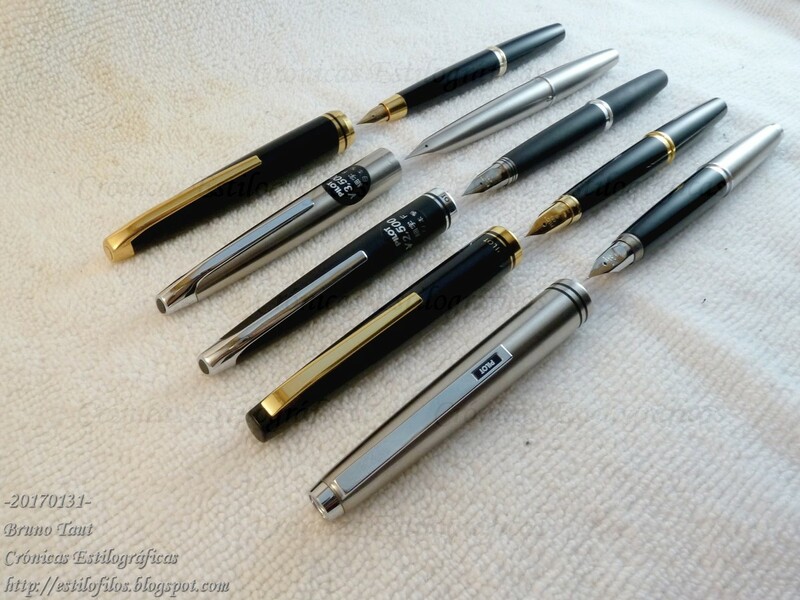 All the pens on this family picture have fine (F) nibs. 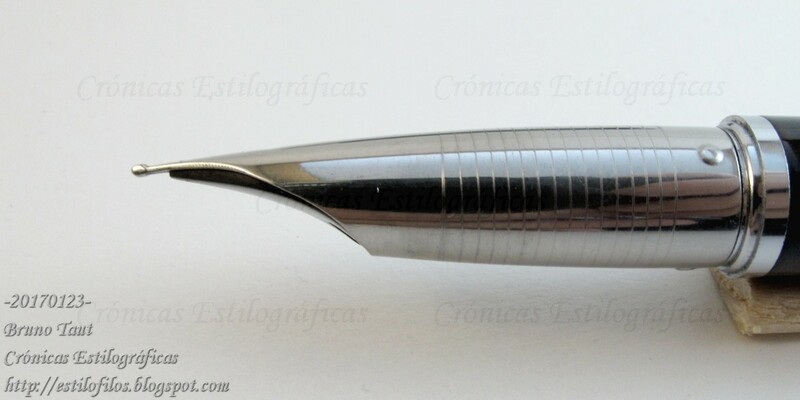 Medium (M) nibs also existed.